At the graduation and completion ceremony at the National Institute of Technology, Okinawa College in Nago on March 18, Aya Arashiro, 70, who runs the dining bar “Aya” in Nago, watched over two foreign exchange students. 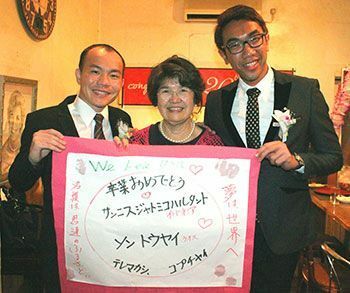 Arashiro has been supporting foreign exchange students from schools like the Okinawa College and Meio University as the “Mother of Nago,” before sending them off to their respective countries, since around 20 years ago. The two students graduating from the Okinawa College this year are Sunny Sujatmiko Hartanto, 22, from Indonesia, who is graduating from the Machine System Engineering department, and Son Tuayai, 23, from Laos, who is graduating from the Biological Resource Engineering department. Arashiro looked after the two students by letting them stay at her house on the weekends, and introducing them to local people at the restaurant.